On the East Coast, surfing doesn’t get any better than Folly Beach. And the Washout is the best-known surfing destination on the Edge of America. The strip of land on the neck of the island was nicknamed the Washout after Hurricane Hugo flattened the beach, road, houses, and land. The way the wind blows without obstacles over the land and out to sea create the big waves and ideal surfing conditions. While surfers of all skill levels flock to the Washout, beginners might be better off up the beach where the waves might not break quite as big, and crowds typically arent an issue. So heres your guide of where else to surf on Folly. The Pier: The waves below the Edwin S. Taylor Folly Beach Fishing Pier break soft and gentle, but beware that the crowd during peak season might make surfing difficult. A longboard is recommended, and no surfing is allowed during busy beach hours over the summer. Between Sixth and Seventh Streets: Less busy than the Pier, this surfing location is known for its fun waves and unpredictable currents because of the man-made groins. Between Ninth and Tenth Streets: Larger, stronger waves mark this surf spot. Plus the beach is wide here and tends to be less crowded. Handicap Access: Just past the Washout, this location is marked by a public beach access. 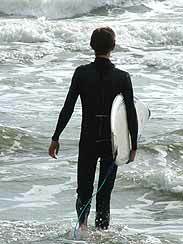 The waves are smaller, but just off the groin, there surfing can be fun. Second West: Just south of the Pier, this location surfs a lot like the pier, except there are less swimmers and sunbathers. This is a great spot for beginners. Fourth West: Look out for a sandbar that defines the waves here. But watch out for the groins when the waves are breaking. Eighth West: Without a crowd, these waves are smallish but the lack of crowd makes this a great surfing spot.